Alan Hart, our beloved father, passed away yesterday at the age of 75. Although his passing was sudden, he had been unwell for the last few years. We thought we had lost him a year ago, but he got better and was able to continue working for peace and unity in the world. He went into hospital yesterday morning and, whilst he remained unresponsive, his heart remained strong for as long as it could. But in the early afternoon, a calmness came over him, vital signs began failing and a body shut down shortly followed. We were there to hold him, say our goodbyes and support each other. The human body – his home no more. His energy, essence and spirit – well & free. We sincerely thank all of you for the trust, friendship and support you all showed and shared over the years. We know that he appreciated it very much and so do we. p.s. We are compiling an album in memory of Alan that will be present at the funeral and then kept by Nicki (his wife, our mum) in the family home. If you would like to contribute a reading, a poem, a photo, a memory or any other form of appreciation for Alan, his life and works, please provide it as comment below or email it to [email protected] (as soon as possible). We welcome your contribution. This is truly sad news. I have read Alan's work for many years. He had a unique perspective on the world that I was lucky to be challenged by. I'm very sad to hear this news and send sincere condolences to Alan's family. He has left a fine legacy with his books exposing Zionism and the work he did to seek justice for the Palestinian people. RIP. Very sad. I read Alan's work for many years and learned a lot. Alan's 3-volume set has been my most comprehensive single source for knowledge about Israel's 70-year armed robbery of Palestine, and has been used extensively in our education and advocacy for Palestinians for almost a decade. I'm immensely grateful to him. The Palestinians who have maintained a heroic and steadfast resistance deserve him and he gave them his best, more than have their fellow Arabs. Many signs suggest that the tide is finally turning here in the US, and I regret he hasn't lived to watch the ripening fruits of his labor. I will remember him when Zionism collapses, Palestine is free and the refugees come home. RIP. A man most worthy of the name peacemaker. His work taught me and so many others the truth of the conflict. In spite of knowing all their faults he never lost faith in humanity. Bless all his family at this sad time. He will live on forever in so many hearts. I am sorry to hear of Alan's passing. It is no over-statement to report that his three volumes on Zionism virtually changed my life. Thank you, Alan. Alan exposed the terrible crimes of the Israeli Zionists and was a beacon screaming out for justice. As soon as he took that position he was put out into the cold. But he never regretted it. I am sad. People like him clean the world. Yes, he was a truly peacemaker. An example to keep always in mind and heart. I had the good fortune of reading Alan’s commentary and articles . He was a man with out fear and told the truth ! Very few have his courage ! May he Rest In Peace . What a sad news! A true peace maker and a "pacemaker" for a world that has lost the tone of truth in favor of easy positions. His dream will come true when America will wake up one day to find out how much his great people have been deceived by corrupt politicians to help splinter the Palestinian people. I was blessed with finding Alan Hart's writing some years ago. I followed him faithfully and missed him the past few months. His death is a devastating loss for each of us. I feel his loss in my heart, although I never met him. But I knew his wisdom, his fairness and his hunger for justice. May he rest in peace. He is one in the choir of angels in heaven. He was kind enough to come to Kalamazoo and give a talk about his work and perspective of the struggles that Palestinians are forced to endure. His voice, his witness, his legacy are important for a better world I long for. I wish that Amy Goodman would explain why she would not return Alan's calls. RIP, Alan Hart. Our prayers are with Alan family during this time. Thank God for his love for his family. Thank God for his love for Justice. May the Holy Spirit comfort your hearts during this time as u remember his life, his love & his work for Justice for Palestine. I had the privilege to meet him & host him in Atlanta, GA when he spoke @ Agnes Scott College. I learned more about the true history of Palestine from Alan than from anyone else. I think that must be true of many others as well. Alan was not only a great truth seeker, he was a genuinely compassionate person. If the world had listened to him, we would not have the Apartheid regime that we have in Israel today nor the Crimes Against Humanity that that regime commits on a daily basis. So sorry to hear this sad news. I remember meeting him in Manchester when he spoke at the Friends Meeting House on his book on Zionism. Police were called to remove disruptive local Zionists. 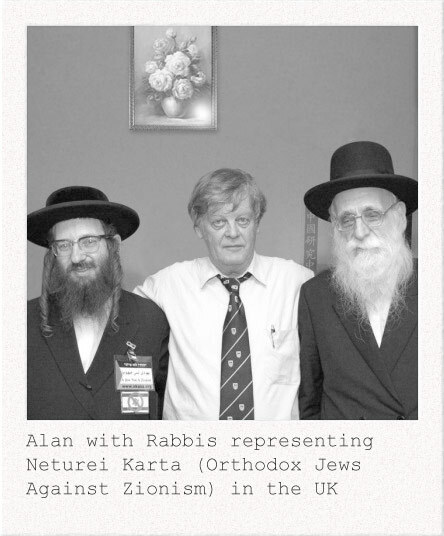 One day the disruptive Zionists will also be removed from Palestine because of those like Alan who remained faithful to truth, goodness and humanity. God Bless you Alan. Love and condolences to your family. I recall my dismay, years ago, when Alan announced that he was turning down his effort for lack of funds. His three-volume work is a classic, comparable to "The Palestine Diary" - Robert John and Sami Hadawi. I shall miss Alan Hart. In the multitude of your mighty men. A mother dashed in pieces upon her children. Shall be cut off utterly. It was a pleasure to know Alan and to host him in Frome. What a brave individual he was in his endeavour to continually speak truth to power. He will be greatly missed - an amazing man and one of life's characters - a true individual who I am very proud to have met. RIP, Alan Hart. A fine writer. An enduring advocate for Palestine. A relentless voice for justice and peace. So sorry to hear this sad loss to many people who are so thankful and grateful to him as he was their voice - standing up for social justice and human rights both here in the UK and abroad and exposing the corruption of certain organizations in high office. Sincere condolences to his family - may he rest in peace. I knew Alan and admired his writings and commitment to the much suppressed truth and justic for Palestine. I hadn't seen him in person in a dozen years he bought me a couple of gin and tonics in the bar of the Hotel Russell in London where we both were staying. I had always hoped to have the opportunity to repay the courtesy. His books on Zionism should be in every activist's library. A decent, honourable and dedicated man. Riposa in pace. Ti ho incontrato una volta sola e quell'unica volta ho incontrato un vero costruttore di pace. In any discussion with Alan you were struck by his compassion and zero tolerance of any form of racism including anti-semitism.His essential take home message was that the Zionist project is in the long term as much a disaster for World Jewry as for the Palestinians, a failing demographic experiment based on a false hypothesis 'land without a people'which can only end in tears.His mission as peacemaker will be his legacy and should temper our sadness at his passing. He will be missed for peace in Middle East! Alan has been inspiring for his kindness, empathy and humanity. He was fearless. Having read his writings, I took the chance to meet him in Freiburg, Germany and since then Alan has been present in my mind. So he will stay in the future! No one better than Alan would explain the danger of Zionism, for the Jews and for the World. My thoughts are with his family! R.I.P. We need more Alan Harts in this troubled world.He was an intellectual, a man of integrity and truth.His contributions will live on and remind the world that "there was a thinker who worked towards better understanding between people".May his memory be eternal. God rest his soul. Deeply saddened to hear that Alan is no longer with us. An indefatigable campaigner for truth and justice, he will be sorely missed. My heart-felt condolences to his family. It is hard to improve on some of the comments made here. I didn't know Alan Hart personally, but followed his work very closely, and improved my education. My great thanks to him for that. His wisdom will be missed. I am deeply grateful for his integrity, principles and the great work in revealing truth and exposing lies that he has engaged in over the decades. He will be sorely missed and his legacy is a treasure. RIP Sir Alan Hart. Well done, indeed. Condolences and heartfelt best wishes to the family and friends of this great man. He seemed to bring a humanity that very few could. He seemed to genuinely care about people and love his subject. These are sadly lacking in today's journalism - which seems devoid of historical understanding but full of technology savvy to file the story fast. He will be missed. Thank you to his family who must have sacrificed to allow him his space to do the things he did. I followed Alan's writing very closely and learned greatly from his profound insights and courage. 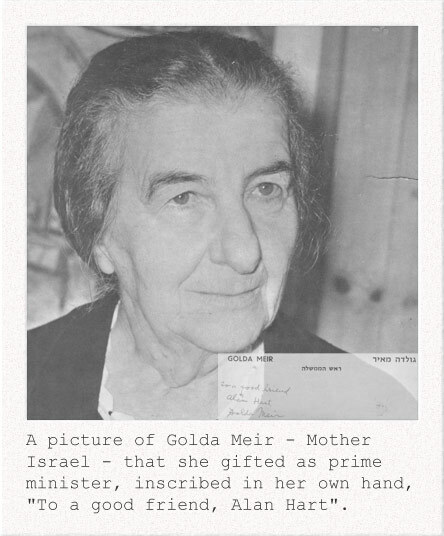 To those of us engaged in the struggle against Zionist terror, his work was exemplar. I received the sad new of the death of my friend Alan Hart. Great journalist of the BBC and the author of the book "Zionism the Real Enemy of the Jews" that I had the honor to translate for the Italian readers. In april 2016, we had together, in Sardinia, a tour to promote his book. In Nuoro he felt ill and was hospitalized. I tried to convince him to stop smoking, but in vain. A few weeks later he wrote to me saying that he had a tumor and stopped to smoke for ever. We lost a great journalist, a writer, a friend of the Palestinian cause, a great historic that knew all the protagonists of the middle eastern tragedy. We can honor his memory reading his books written through direct knowledge, for love of the truth and for love of the victims of the Zionist cruelty. Alan Hart, We have lost a true friend who was devoted to justice, and peace. He always got to the Heart of the matter by saying the truth and exposing the injustices that Palestinians suffered from the Occupier of their land. Alan Hart, a man of integrity, political courage and so much more. I met him ,I read him, I believed that Palestine was his intimate conviction. He will be severely missed by Palestinians. I first came to know Alan’s work when I read ‘Zionism, the real enemy of the Jews’, a thoroughly well researched, riveting expose of Zionism, which also gave an interesting insight into Alan’s intellectual journey through his years as an investigative journalist. My condolences; the world is a better place for Alan having been in it. I'm Alan's son and I would like to thank everyone for your kind words, on behalf of the family, we are deeply touched. "Legend" is a word that has been played back to me by several of his former colleagues this week. Jon Snow of Channel 4 news emailed me earlier this week with a perfect summary: Your Dad was always on the right side of history, a good and honest man, right on the Middle East before other reporters and writers. Dad always believed that his spirit would live on, he knew not where, but never thought death was the end. I admired Mr Hart for his enduring courage in the face of vilification. Recalling the period of open (even proud !) Zionist terror in 1947-8, as shown on newsreels, I continue to be aghast at the shamelessness and rank cowardice of the Israeli Establishment today, with its wide support among Jewish Establishments around the world. Some reports suggest that, very gradually, younger Jews in the diaspora are beginning to see the light. Like all colonialisms, Zionism is essentially racist/quasi-racist, and Mr Hart's contribution to its exposure will remain valued. As chair of Manchester Palestine Solidarity Campaign I had the good fortune to meet Alan when he came to launch 'Zionism,The Real Enemy of the Jews'in 2007. Hosted by our campaign he spoke to a packed hall despite efforts of the Zionists to sabotage the event. He was a brilliant presenter, clear and dedicated. I personally learned so much from his writings. He stayed overnight in mine and my husbands home, we found him a kind and gentle man. Really sad to hear of his death, our movement has lost a brave and supportive friend. My heartily condolence. 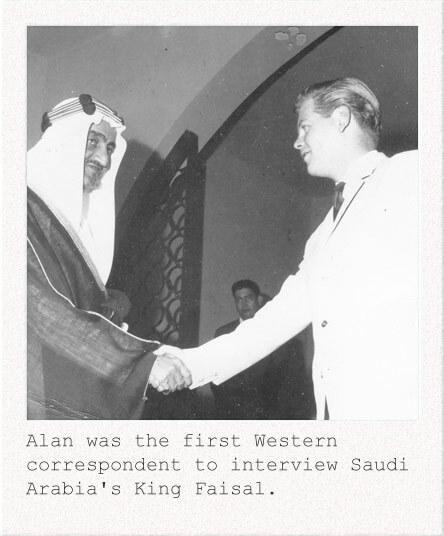 Alan was a real peace maker, a man with big heart and has a chrystal clear vision. You are lucky family, Alan have made for you much huge family than anybody else. I have followed what Alan write for many years. His writing was always touching my heart, clearing the truth, and inviting the world to make a real peace. Thank you again Alan, we will never forget you. Ciao Alan, nell'aprile del 2016 ci hai onorato della tua presenza presso la sede della nostra associazione, ci hai descritto da giornalista e intellettuale libero fatti e avvenimenti del mondo contemporaneo, delle ingiustizie subite dal popolo palestinese. Grazie per le tue parole e di averci dato l'opportunità di conoscerti. Centro Iniziative Culturali ARCI Iglesias. My sincere condolences to Alan's family. His passing is a great loss. 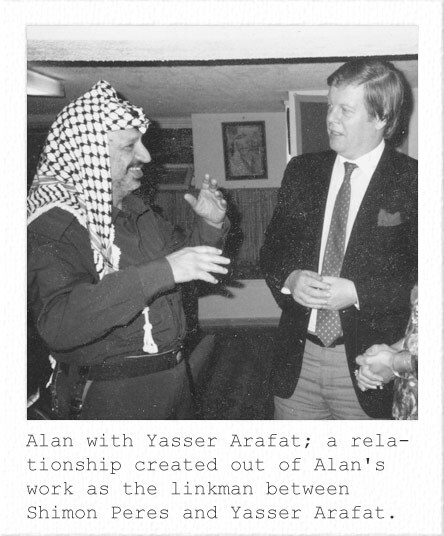 I had the pleasure to meet Alan many years back when I worked at the Palestine Observer Mission to the United Nations in New York. We talked about what it meant for people like ourselves, non-Arabs, to be in solidarity with Palestine, and after several hours we both agreed that if in our lifetime we could at least make one historical wrong right, whatever the sacrifice to our reputations, would be well worth it. Neither of us had regrets about our commitment to exposing the terrible wrong done to the Palestinians. RIP Alan! 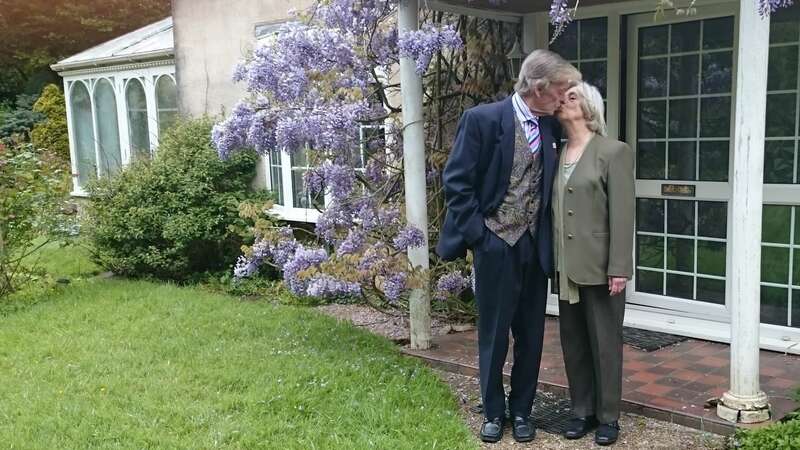 Thank you Alan for all your efforts and convictions all these years, you dedicated your life to peace in a place where many dont want to see that peace. You dedicated your life for the truth when so many were putting all their effort on building a different truth. All your work and dedication is an immense gift to all of us who should pursue your path in a hope for a better more just world. I have just heard of Alan’s passing from my mother Sue, my father Ian worked with Alan back in the day, producing the World Focus film ‘ 5 Minutes to Midnight’ in 1975. Those were heady days for a six year old, a legacy which remains with me today. I learnt from an early age that injustice in all its forms has a hidden agenda, where victims are vilified and perpetrators praised. 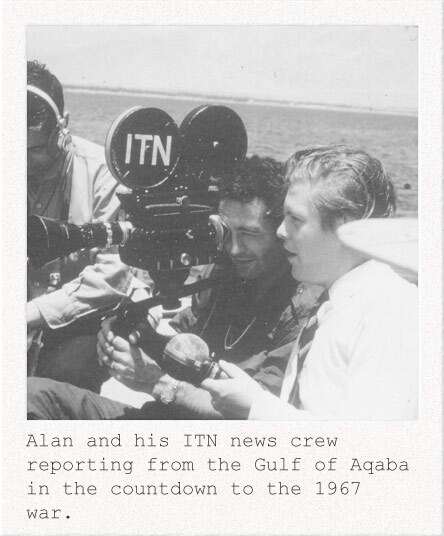 When I reflect on Alan’s and my fathers work, they gave a sympathetic voice to the forgotten, a voice which often ran contrary to mainstream narratives, so much so, that some of their work never got aired. Those were the days of the real information pioneers, when crews would be on the frontline with bullets whizzing over their heads, none of this biased ‘embedded’ malarkey. Two great guys who gave a voice to those who never got the chance to be heard. Peace will endure long after the dust settles. Just found the sad news. Huge loss. Prayers and blessings to Alan's family and friends. RIP brother. He will be deeply missed and I aam really sad to hear aabout that. I want to thank him for his genuine work and amazing coveraage of wars in the Middle East. I mourn my good friend Alan Hart, who died too soon. Unfortunately, our planned reader's journey did not take place any more. I miss him painfully, the friend, people and incorruptible journalists like him are rare. We were especially united by the struggle for a free Palestine, without Zionist occupation. In his countless books and articles his life's work remains unforgotten. My sympathies go out to his family. To tell the historical truth is a great risk to one's life in today's violent environment. The enemies of mankind are constantly on the lookout for those who dare tell the whole truth and nothing but the truth at the sake of hurting friend and foe alike. I believe Alan Hart was brave enough to risk his own life by following his conscious to reveal to the world the truth and consequences of what Zionism is all about. And he followed his conscious knowing full well that the truth if told enough will eventually set people free who suffice to say have been caught in a cobweb of lies to say the least. 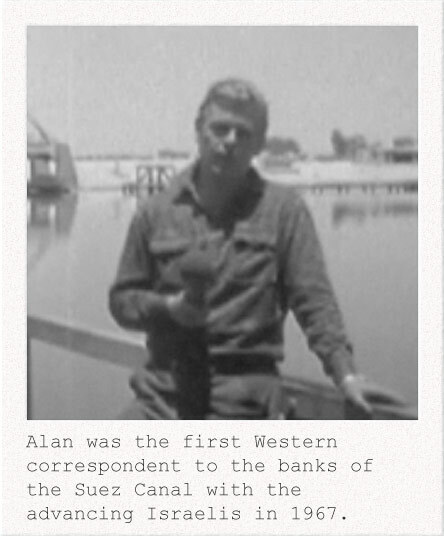 Alan Hart was a reporter and writer but most of all he was a humanitarian and a freedom fighter for the oppressed. He did his part and will not be forgotten for many years to come. I just saw his Youtube video "Zionism: The Real Enemy of the Jews" and clicked on his website link (here) to look for the part he left out about "Does Israel Have a Right to Exist?" I was surprised (and dismayed) to learn that he had passed. Please accept my condolences. They say that first impressions are the ones that last - and after listening to him speak my first impression was that he was an amazing and very insightful man. Let me add to what I have already said above. Alan Hart did his part by exposing Zionism for what it is. Now it is us who have to do out part in exposing the apartheid system that keeps the Palestinian people in a state of genocide existence. Alan Hart was accused of anti-Semitism, but he was all to the contrary. To be anti-Zionist does not mean you are anti-Jewish. The same is true to be anti-Nazi does not mean you are anti-German. Unfortunately, the Zionists in America have too much influence in politics, economics, and the media. They get their way in making sure that the Zionist Israeli government has full American support in what they do to the Palestinian people who have been disenfranchised and unwelcome in their own lands. The concerned people of the world denounced apartheid in South Africa calling for its abolishment. The concerned people of the world must also denounce and call for the abolishment of Israeli apartheid against the Palestinian people. But this can not come about unless Zionism is also abolish. Alan Hart was very much conscious of this. This is the reason he wrote his celebrated book, Zionism: The Real Enemy of the Jews. We must follow Alan Hart's example of speaking out against injustice and not remain complacent and indifferent.